VMware is one of the market leaders of virtualization solutions and VMware ESXi is a well-known type 1 hypervisor that is highly respected by IT specialists. More and more people as well as companies are deploying ESXi servers in their environments for running virtual machines. An ESXi hypervisor is provided as a part of VMware vSphere which, in turn, comes with different licensing options for each edition. Each VMware vSphere edition has its own price but VMware also provides a free version of ESXi. Today’s blog post explores features of free VMware ESXi as well as restrictions and limitations that await you if you use this version of an ESXi hypervisor. You can download an ESXi installer ISO image from VMware website, for which you'll need to have a VMware account. The installer file of a particular version (for example, 6.7) of an ESXi hypervisor is the same for all editions. A different set of features and capabilities is defined after applying the appropriate license. After installing ESXi, a full-featured 60 day evaluation period is started. You can use all features available for the Enterprise Plus edition during the 60-day evaluation period. If you apply your license before the evaluation period expires, you can only use features allowed by your license. If 60 days have passed and no license was applied, then all advanced features are locked, running VMs continue to run but you cannot start powered off VMs. ESXi hosts connected to vCenter Server are disconnected in this case. You'll need to apply a license (free or paid) to make your ESXi server work again. Where can you get a free license key? 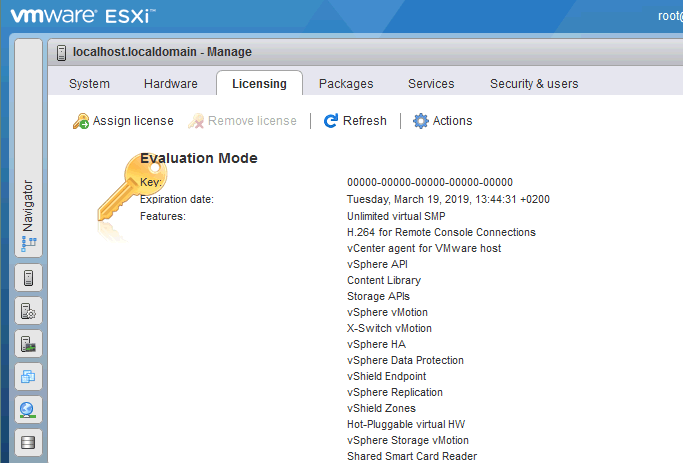 When you have registered on VMware website, you can request a free license key for ESXi. 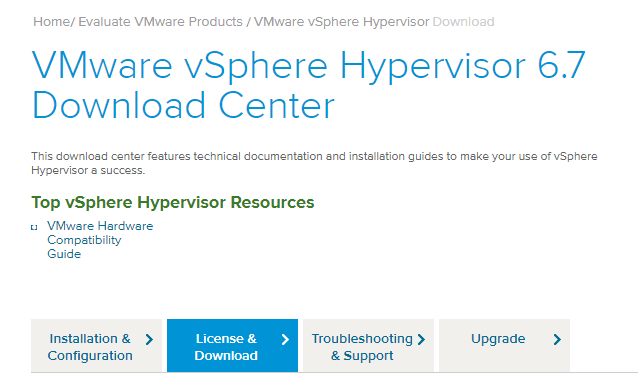 You can get the key on the License & Download tab of the vSphere Hypervisor Download Center page. When you have downloaded the installer and received ESXi free license key, you can install the ESXi server according to the process described in this blog post. Once you have installed an ESXi server, open your web browser and enter the IP address of your ESXi host to open VMware Host Client. Enter root as the user name and the password you specified during ESXi installation to log in. In the left pane (Host Navigator) select Host > Manage and then select the Licensing tab. As you can see in the screenshot above, a host is running in the evaluation mode. In the current example ESXi was installed on the 18th of January and the expiration date is the 19th of March. A full list of features available for the 60-day evaluation period is displayed on this page in the features section. The license key is displayed as 25 zeros in this case. Let’s apply a free VMware ESXi license key. Click Assign License and enter your key (25 symbols). Click the Check License button, and if your license key is valid, click Assign license. Now your license type has changed from the Evaluation mode to VMware vSphere 6 Hypervisor. The “Up to 8-way virtual SMP” string is displayed in the features column. SMP means Symmetric Multi-Processing – a feature that defines the number of cores that the host can schedule a VM to use at once (8 cores/virtual processors in case of using a free license). The expiration date is changed to Never. In the screenshot below you can see the output of this command for ESXi running in the free mode and for ESXi running in the evaluation mode. A list of available features is much longer for the ESXi server that is running in the evaluation mode. Now let’s have a closer look at restrictions when using an ESXi server version 6.7 with a free license. Depending on your environment, some restrictions may be unnoticeable for you while others can be critical. There is no commercial technical support provided by VMware for free ESXi. You can ask the VMware community for support, and with any luck, you can find a solution for resolving your issue. While commercial VMware technical support works 24x7 and usually provides answers in short order, help in resolving issues by the VMware community may take somewhat more time. VMware commercial support also provides software upgrades. If you create a VM with more than 8 virtual processors (for example, a VM with 9 virtual one-core processors or a VM with 5 virtual two-core processors), the VM is likely to fail to start on free ESXi, showing the error “There are insufficient licenses to complete this operation”. At the same time, with the Evaluation or Enterprise Plus editions you can create a VM with up to 128 vCPUs (virtual Central Processors Units) assigned to that VM. The 8 vCPU restriction may not cause significant disadvantages, unlike the following two restrictions. The free version of an ESXi server cannot be managed with vCenter – a centralized server for managing hosts and virtual machines. If you try to add an ESXi host with a free license to vCenter Server, you can expect to get the error: “License not available to perform the operation”. Hence, you cannot migrate machines from one free ESXi host to another as well as use clustering features, because vCenter Server is required to perform these operations. This is a significant disadvantage if you are planning to use multiple ESXi hosts. VMware provides a data protection framework that is called vStorage API (Application Program Interface) for enabling centralized backup of virtual machines on a host level. vStorage APIs allows third-party applications to make VM backup more efficiently as well as offload CPU, network, and storage. ESXi Server Free Edition doesn’t allow applications to interact with that ESXi server via vStorage APIs, hence, VMs cannot be backed up from the free version of ESXi on a host level. Your backup application should display an error message in this case. You can only perform a legacy backup of VMs running on the free version of ESXi host that requires the agent installation on the guest operating system. This blog post explains why legacy backup is not recommended for backing up virtual machines. Now that we’ve gone through the disadvantages and limitations, let’s review the non-limited features and advantages of free ESXi. A free ESXi license allows you to use an unlimited number of physical processors for an ESXi host (VMware vSphere Hypervisor). In old versions of ESXi a free license is restricted to using more than 2 physical processors. The processor is virtualized but not emulated in case of hardware virtualization and is one of its primary components. Cores per physical CPU are not limited with the free ESXi license. This feature allows you to utilize hardware CPU performance rationally. One CPU core can be used as one virtual processor or one virtual processor core for a virtual machine. Similarly to physical CPUs and processor cores, physical memory is not limited for an ESXi server that has a free license. Along with unlimited CPUs and CPU cores, this feature allows you to deploy a powerful physical server that contains 4, 6 or more multicore CPUs with large amount of RAM, install ESXi, apply a free license, and deploy many VMs (max. 8 vCPUs per VM). Get a free ESXi license once, and feel secure in the knowledge that it never expires. This means that you can use ESXi server free version as long as you want. If you need to apply a commercial license, you can do it at any time without re-installing your ESXi server. 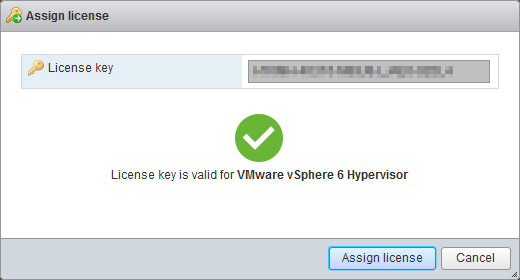 Just open the licensing options in your VMware host client of VMware vSphere client and enter a new license. VMware provides a loyal licensing policy. You can start diving into the wonderful world of hardware virtualization with free VMware ESXi, also called VMware vSphere Hypervisor, according to the VMware licensing terms. Free VMware ESXi can be considered a nice solution for small companies such as small shops and self-employed people, as well as for testing or learning purposes. The ability to use unlimited hardware resources (CPUs, CPU cores, RAM) allows you to run a high number of VMs on the free ESXi host with the limitation of 8 virtual processors per VM (one physical processor core can be used as a virtual CPU). The main disadvantages of using free VMware ESXi are the inability to use vStorage APIs and, as a result, use native backup applications for performing host-level VM backup, as well as lack of access to centralized management with VMware vCenter Server. Despite the limitations, using free ESXi in a production environment is not prohibited by the license agreement. Read more in the blog post about VMware vSphere editions and licensing.